From the Special menu, choose Reminders; this feature of mSupply allows you to create notes of tasks that users may need to be reminded about. In the Reminders window of the Preferences , you can check the box which will, if the particular user has been issued with one or more Reminders, display them whenever the user logs in. The Reminders command shows reminders for tasks that are not yet completed. To add a new reminder, click the New reminder button. To edit a reminder, double-click it in the list. To delete a reminder, click on the reminder to delete, then click the Delete button. You can sort the list by clicking on the column headers. Click a second time to sort in the opposite direction. You can change the reminders displayed according to the status and whether the reminder is for you to complete or was created by you. To show only complete or in-complete reminders, choose from the status drop-down list. 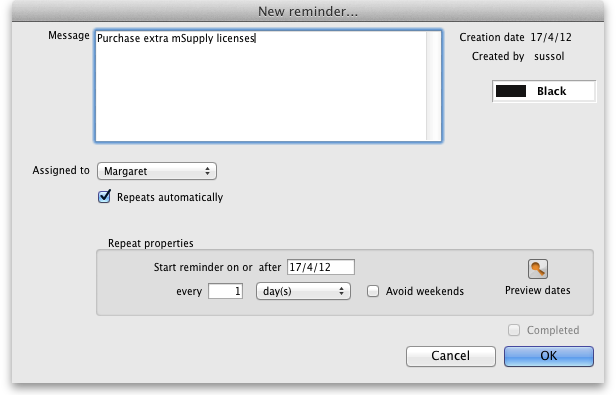 Assigned to: By default you create reminders for yourself, but you can also create them for other users. If you're the micro-managing type, you could put everyone else's work plans in for each day or week! Repeats automatically: Once this box is checked, you will be shown options for the reminder to repeat daily, weekly or monthly. Preview button: clicking this button shows a window with a list of dates that the reminder will recur on. Colour: Use the Drop-down list of colours to set a reminder colour. This colour will be used to colour the reminder in the list. For example, you might want to choose Red for all tasks you intend to do today.